18-karat yellow gold necklace by Jamie Wolf. 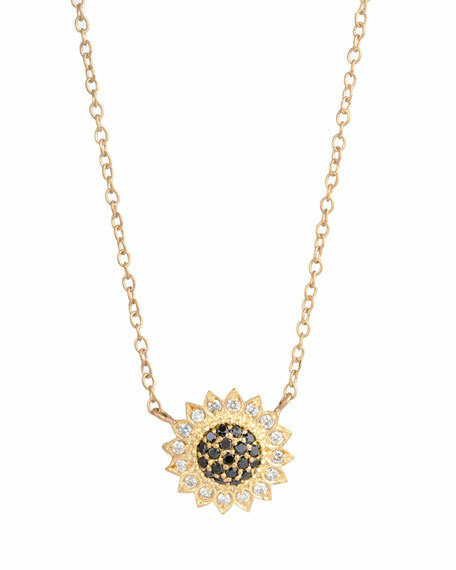 Sunflower pendant with black and white diamonds. 0.38 total diamond carat weight. Jamie Wolf jewelry began when the designer's love of art and fashion led her to leave the New York City Ballet to focus on what had been, until then, just a hobby. The ten years she spent as a dancer have influenced her aestheticshe believes that femininity is timeless, and that beauty is often found in the finest details. As a designer, her aim is to translate this femininity and detail into pieces that are chic and relevant. Each season the collection evolves with this intent, working with what is classically beautiful and articulating it with a sophisticated edge. The result is a balance between luxury and utilitya collection that is stunning, and entirely wearable. Each 18-karat yellow, white, or rose gold piece is handmade in New York City. For in-store inquiries, use sku #921768.